The free parameters in the model are C and epsilon. The implementation is based on libsvm. The fit time complexity is more than quadratic with the number of samples which makes it hard to scale to datasets with more than a couple of 10000 samples. 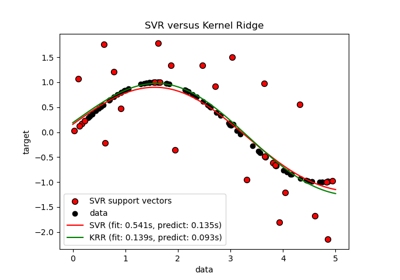 For large datasets consider using sklearn.linear_model.LinearSVR or sklearn.linear_model.SGDRegressor instead, possibly after a sklearn.kernel_approximation.Nystroem transformer. Penalty parameter C of the error term. Epsilon in the epsilon-SVR model. It specifies the epsilon-tube within which no penalty is associated in the training loss function with points predicted within a distance epsilon from the actual value. Coefficients of the support vector in the decision function. 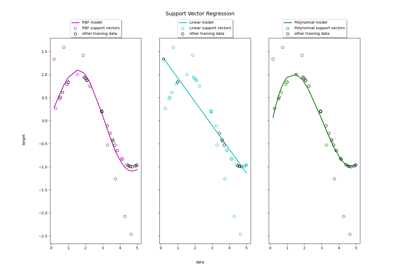 Support Vector Machine for regression implemented using libsvm using a parameter to control the number of support vectors. 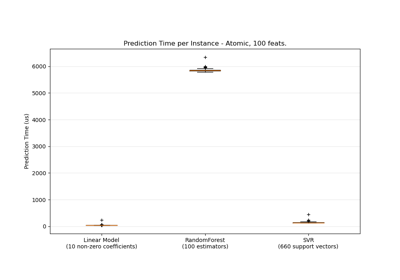 Scalable Linear Support Vector Machine for regression implemented using liblinear. predict(self, X) Perform regression on samples in X. Perform regression on samples in X. For an one-class model, +1 (inlier) or -1 (outlier) is returned. For kernel=”precomputed”, the expected shape of X is (n_samples_test, n_samples_train).